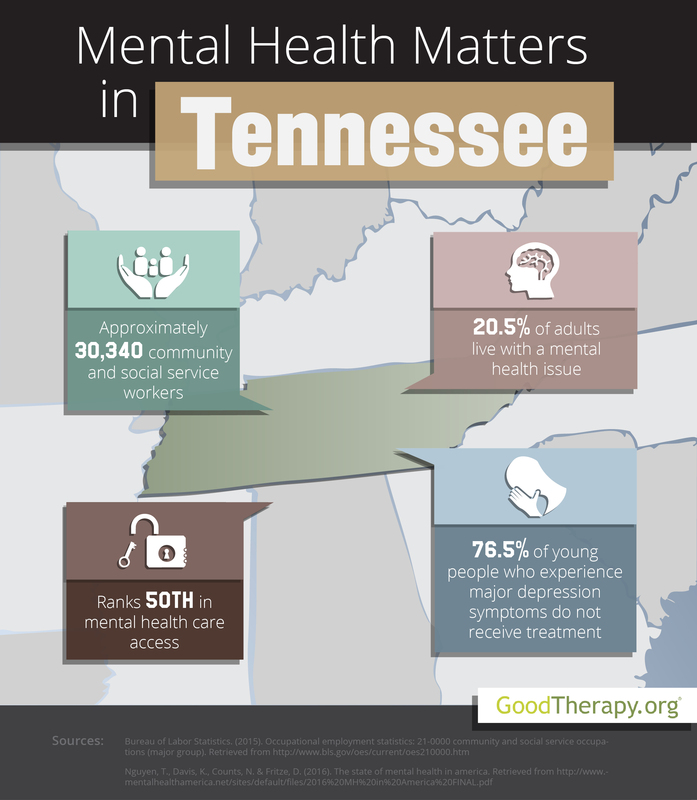 Find a therapist in Tennessee with GoodTherapy.org. Tennessee was inhabited by 6.6 million people in 2015. The median household income for Tennessee residents in 2010-2014 was $44,621. 30,340 people worked in social and community service occupations in 2015. Typical jobs within this group include working as a clinical social worker, therapist at a depression treatment center, counselor at a drug and alcohol rehab center, probation officer, religious worker, community health worker, or a marriage and family therapist. In Tennessee, therapists and people in related professions earned an average annual wage of $39,120. Mental Health America (MHA) conducts an annual survey on the mental health conditions in all states plus the District of Columbia. In the 2016 report, Tennessee was ranked 40th for overall mental health conditions. The mental health experts who conducted the 2016 survey, as well as some therapists in Tennessee, believe the state’s low access to care ranking is related to local factors such as high rates obesity, child maltreatment, and violent crime. Although Tennessee has one of the highest percentages of adults with mental health issues—with 20.5% of adults affected—the state also has one of the lowest rates of addictive substance use by adults, at 7.6%. Mental Health America ranked Tennessee 47th and 3rd in these respective measures. Even young people in the state display a relatively low percentage of substance abuse issues, with the state finishing 14th in this category. After conducting a 2014 investigation on behavioral health in Tennessee, the Substance Abuse and Mental Health Services Administration (SAMHSA) reveals Tennessee had lower percentages of cigarette use among teens, binge alcohol use among residents ages 12-20, alcohol dependence or abuse among individuals age 12 or older, and heavy alcohol use among adults age 21 or older than the respective national averages. However, residents who need professional services may experience some socioeconomic barriers to treatment. The 2016 MHA survey shows Tennessee was ranked 50th for adults with mental health concerns who were uninsured, 42nd for adults with disabilities who could not afford care, 50th for young people with major depression who did not receive any mental health services, 49th for young people with severe depression symptoms who received consistent depression treatment, and 43rd in availability of mental health providers in the state.